Welcome back dear readers in 2014! It has been quiet on my blog as I’ve been so busy the past few weeks. I moved house just before Christmas, so the last weeks were spent painting, unpacking boxes and decorating. I took a little timeout between Christmas and New Year to go to Austria and recharge my batteries (and eat lots of grandma’s Christmas cookies). My knitting needles and designs lay neglected in my suitcase as I was too busy snowboarding, walking the dog and sleeping. Austria was covered in snow, and during one of my evening walks while looking at the bare trees glistening with frost under a full moon, the idea for the Moontree Pillow was born. 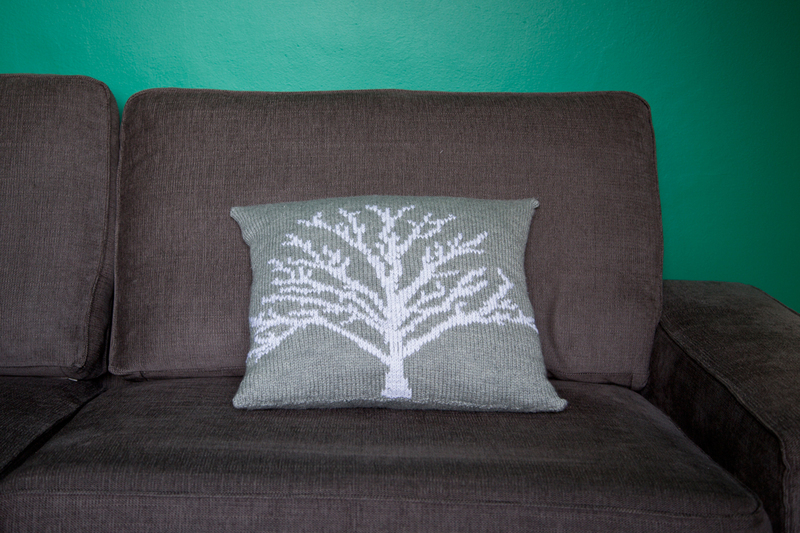 This pillow gives the illusion of colourwork, the tree motif is embroidered on after the knitting is finished, giving the tree a slightly raised and more defined texture than if it was knit into the the fabric. It also means you’ll only knit with one colour at a time, making it a great colourwork project for a beginner knitter. The pattern is available for download in my Ravelry Store. I have used new Rowan Yarns Pure Wool Worsted for my pillow, it’s a wonderfully soft, superwash yarn that comes in a whopping 50 shades. The colours are beautiful and vibrant and the colour palette is well chosen, making this new yarn an instant stash staple. My pillow was knit using colours Moonstone and Ivory, but it would look gorgeous in any colour combination. I will be giving away the pattern to one lucky reader for free! Simply comment on this post and tell me what your favourite thing about winter is! Competition runs until February 2nd and the winner will be announced on the IamSnowfox facebook page and Twitter. I love curling up in the evenings with a good book or craft project! My favorite thing about winter is that I live in Florida and knit for all in the north ans knit for those south of the equator in our summer month. I love the pillow. hope I’m a winner!. My favorite thing about winter is SNOW! Lovely. I love the raised look of the tree in relief. My house is called Woodlands and I try and pick up the them in my interior accessories – would love a free pattern. hot cocoa and of course a pile of knitting! I like being able to travel to warmer weather. My favorite part of winter is the holiday season. My family lives far away, so the holidays are our chance to travel and catch up. The quiet and stillness after a big snowfall. Your pillow is gorgeous. i love escaping the cold in hotter climates, butr always take some knititng with me. that cushion is beautiful. I love to see the trees outlined by ice and glittering in the sunlight (or moonlight!) There is such an ethereal beauty about winter that sometimes takes my breath away. I Love getting home to a roaring fire, the cats curled up and my wool waiting to be turned into lovely gifts ! I might be able to do this and learn a new skill…duplicate stitch! My favorite thing to do in winter is to sit by a cozy fire with a pot of tea and my sock knitting. Pure heaven! My favorite part of winter is when a new snow falls and I can walk my dogs in the quiet of night. Cosy evenings in front of the fire with my little dog and lots of Woolley projects. My favorite thing about winter is living in Texas where winters (usually) are not as severe as many other parts of the country and world. I do love to see photos of snow, and I do love to experience the beauty and the stillness when it occasionally snows in my part of Texas. Your pillow design is beautiful! I love the first snow day of the year when my entire family gets excited about “hunkering down”, snuggling up, watching movies and drinking hot chocolate! Design captures beautifully the tree after a fresh snow fall when the snow is still clinging to the bark of the trunk and branches. The trees always look magnificent and magical. Dawn in the snow. The stillness of snow falling as the city falls under its spell. My favourite thing about winter is being able to stay indoors in the evening and knitting lots of snug blankets and jumpers for my son and husband! Winter can be beautiful, the snow is like a Christmas card but best viewed out of the window from a cosy room when doing my knitting. I didn’t have a Rowan tree in mind when designing this, but you are right, it could well be one! Fire in the fireplace. It doesn’t get cold enough for a fire often here (S. Texas), so I treasure the times it does. My favorite thing about winter is that I live in Florida and knit for all in the north; and knit for those south of the equator in our summer month. I love the pillow. hope I’m a winner!. I love the fact that Winter is when Nature appears to to sleeping,but life is still there even when everything looks cold and bleak.Winter is a time that tells me I need times to slow down and reflect, to rest and regain energy for the Spring ahead. That’s beautiful! I haven’t tried duplicate stitch before but thank goodness that’s what it is – that level of intarsia would have put me off for sure. Adding to my wishlist now, thanks for the opportunity to win! My favorite thing about winter is Christmas Dinner with all the trimmings, its guaranteed and so satisfying. This pillow would be the perfect thing to relax and recover from the over indulgence afterwards. As it happens I have nearly finished knitting a poncho in the same grey and might even have enough yarn left over for such a project (fingers crossed). Simply beautiful. Would love to knit one. The best thing about Winter is knitting beautiful patterns and yarn into beautiful shawls and scarves. I live to gift them and treasure them. Your cushion pattern looks amazing. I love trees with ice and snow clinging to the branches. My favorite poem from my childhood was “Stopping by Woods on a Snowy Evening” by Robert Frost. It says everything I love about winter. Your pillow could be an illustration for that poem. The best thing about winter is to experience the beauty of new fallen snow. But not have to go out and drive in it. I love preparing my home for family visits during the holiday season, enjoying the company during their visit, and the quiet time afterwards to knit something beautiful or warm (or both!) for those I love after they have gone back to their own homes. 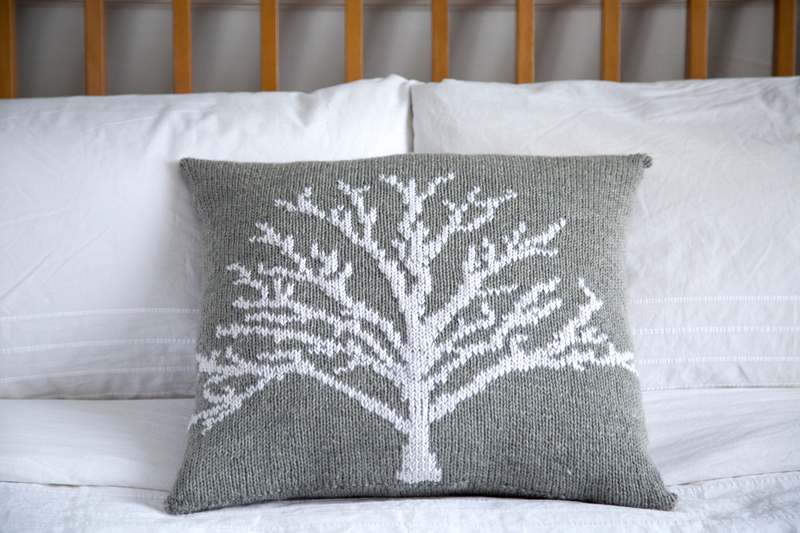 This lovely pillow would be a cherished gift by everyone on my knit-for-list! I also love the striking silhouettes of the trees and bushes against the snow and sky! Their structural strength gives such a delicate lacy effect. I love your pattern! I love tree silhouettes against deep blue winter skies, grey just before it snows skies, laden with snow and ice, majestic lone trees in a field all by themselves against fiery sunsets. I love the winter as my love of all things wool will compel me to get my needles out and knit that stunning tree cushion in celebration of the beauty of the countryside. So evocative of Christmas holidays spent in Austria in the recent past with my family. Its very beautiful, the cushion, I live at the top of a small mountain in a forest village, in Alsace, France and take my dog out walking in the forest all the time, it would be lovely to bring a bit of the forest inside :-) thank you for the chance of winning the pattern. My favorite thing about winter has always been walking at night while the snow is falling; streetlamps turn into triangles of falling snow, trees are in sharp contrast to the soft surroundings and the sound of my father’s footsteps in the snow as we hold hands and walk together. This has been my favorite thing about winter since I was a child: he’s been gone many years, but the magic he showed me that winter night has never left. I love crisp fresh days & wool next to my skin in winter! The best part about winter is getting to wear wool! My knitting becomes much more respected when the temperatures drop and snow starts to fly! Wide sunrises as I drive to work, the reverse shadows of frost and snow against the field walls on the hills and snowdrops on the drive way. My favorite thing about winter is being able to cuddle up in a blanket and read my favorite books on the couch with the fireplace going.